This sounds like a fabulously ambitious park, although the lack of a playground IS perplexing! I think I’m most excited (in the imaginary trip I’m planning) about the ice cave. I’ve never been in an ice cave before! Wow -what an incredible park! Love the idea of areas with micro-climates representing different terrains of Russia. I hope so. I worry that they have wildly underestimaed its long term pulling power though. It’s not a very robust sort of area in some ways. 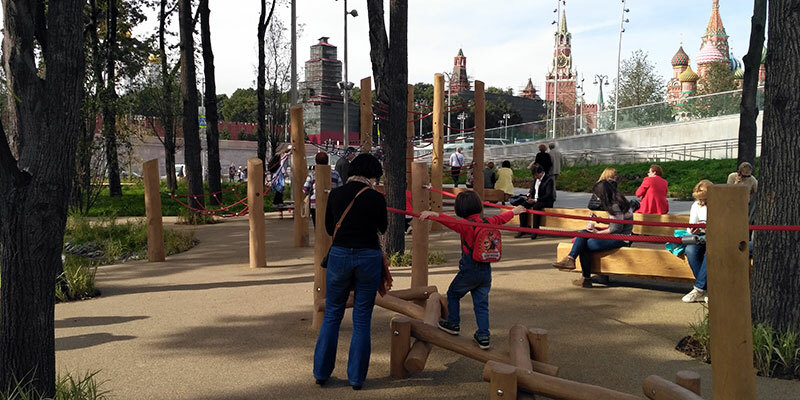 Love the fact that they have recreated the different terrains and landscapes of Russia in the park. That’s such a cool idea! I always find the size of Russia faintly worrying in an agoraphobic kind of way, but it is a good idea! Oh, making people laugh was indeed the intention. In places, anyway. Glad you did! Hahaha, wait six months you say? Good to see mama is teaching you some fine language 😉 The park does look beautiful, and staying on the paths is a sure fire way to help maintain this! Herself doesn’t get to use the extended adult vocab. Unfair, I know, but parents have to have some perks. I think they just underestimated the level of interest. There are a lot of people in Moscow if they all turn up somewhere at once. What a brilliant place to explore. Such a shame they didn’t add a playground! What were they thinking? It’s a very hipster design frim… They did the High Line in New York too, I gather. Love this post. Really sad about stealing all the plants…and crushing them. To be fair, most people were sticking to the paths, it’s just that there were so many people. I didn;t actually see anyone nicking the plabts while I was there either. Still, it is a shame it got overrun! I’ve read a lot of positive changes in central Moscow, mostly from people’s trip reports, and the city looks very pleasant indeed. Hope to visit Zaryadye Park and other places nearby one day. I’ve been to the Russian capital only once when I was 10 years old – it was a school trip, I was tired, exhausted and don’t remember much. Thanks for the interesting post!